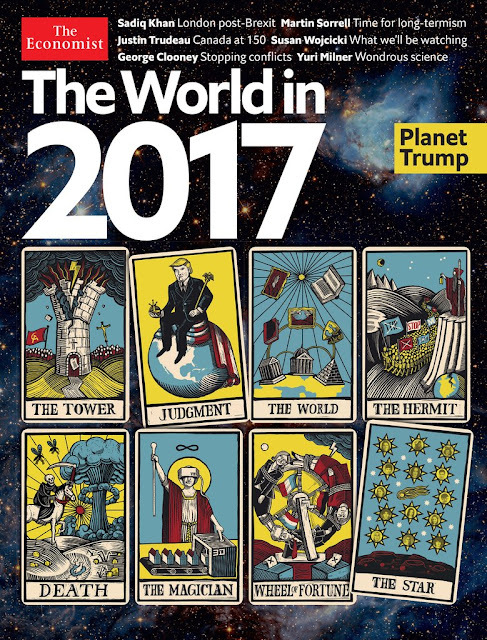 On the recently leaked Economist 2017 cover, titled “Planet Trump,” there are eight highly stylized Tarot cards arranged in two rows of four cards, each. The sixth card in this spread is their interpretation of The Magician. In Tarot, the Magician is the second trump card of the Major Arcana which contains 22 cards. 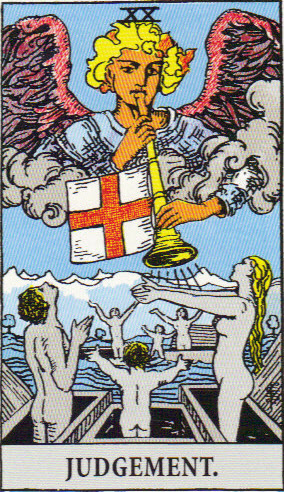 It carries the number 1, since the first card of the Tarot is The Fool, with a value of 0. It’s interesting to note that Donald Trump is also the second Trump, in line with his father, New York real estate mogul, Fred Trump. 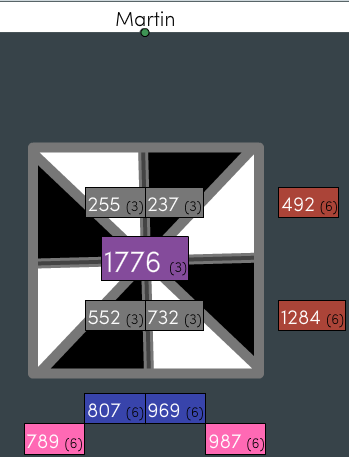 The ancestral name of the family is actually Drumpf. Trump’s grandfather Friedrich Drumpf changed it to Trump after coming to America. One can see how this is conveyed in The Economist spread with the second card being the only one that has Donald Trump in it. 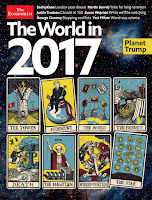 However, before we get into how Donald Trump fits into this, let’s take look at some gematria, symbols and other clues on the Economist card. 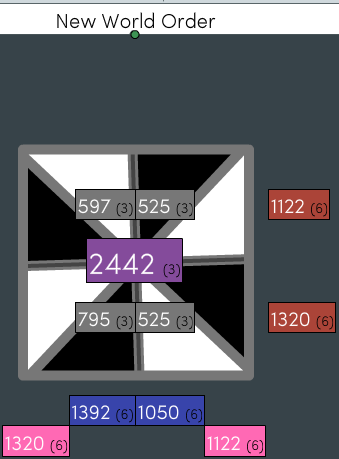 54 is a very interesting number. It’s the only number in English reduction gematria that equals itself, numberwise. 54’s inverse 45 when spelled out as forty-five, also adds up to 54. The spelling of four and forty and the difference in the way the letter -u is left and taken away, in their respective spellings is what makes this correspondence possible. There has been never been a conclusive answer for the purpose or reason behind the change from fourty to forty. However, with the aid of gematria we can see there’s more going on than what first meets the eye. Also to be noted is the number 45’s deep association with the Magic Circle of Saturn as noted in this previous article. 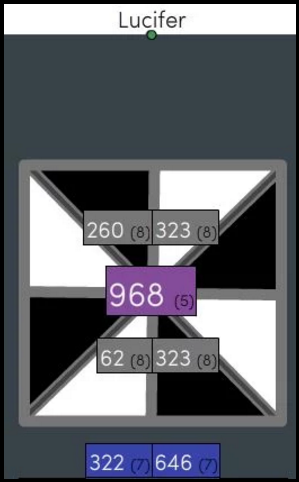 The number 54 has 8 divisors and there are eight cards in The Economist spread. The sum of 54’s divisors is 120, which is the Illuminati number. 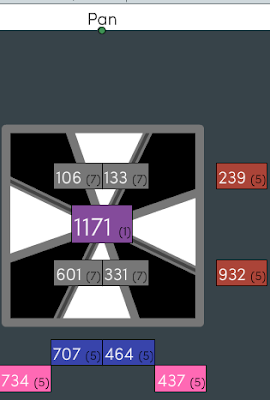 I found a correlation to the mathematics of 54 and the English gematria for The Magician. On The Economist card, the box or cube that The Magician is conjuring cube-shaped starter homes on his conveyer belt, bears the acronym 3D. 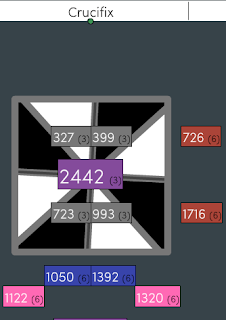 When you write out Three D, it adds up to 33 in English reduction. If looked at from that vantage point, the VR Magician is a false magician or sorcerer. probably the most famous example of this kind of character from literature is Doctor Faust. 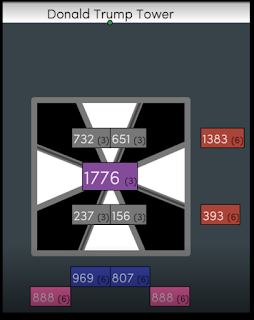 There are other connections in this idea to The Tower card of the Economist spread Both Doctor Faust and Martin Luther were scholars who are associated with Wittenberg, Germany. In the card shown above on the right we can see the representation of the Luther’s Ninety-Five Theses, nailed to the door of The Tower card.. In Faust’s case, the early sources that Christopher Marlowe came across during his own time at the University of Wittenberg. say that Faust met his end when the Devil ambushed him and tore him to pieces on while traveling back to Wittenberg, the place of his birth. In the painting on the left, we can see Mephistopheles, the Devil character from Goethe’s version of the story, tempting Faust with worldly power and pleasure in exchange for his eternal soul. 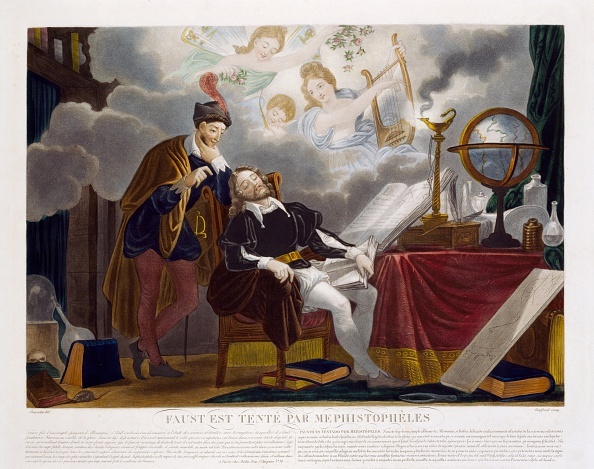 His alchemical books and instruments are also featured in the painting. For all practical purposes he’s in the same predicament as The VR magician of the Economist deck, in the thrall of forces that promise paradise, but bring hell on Earth. 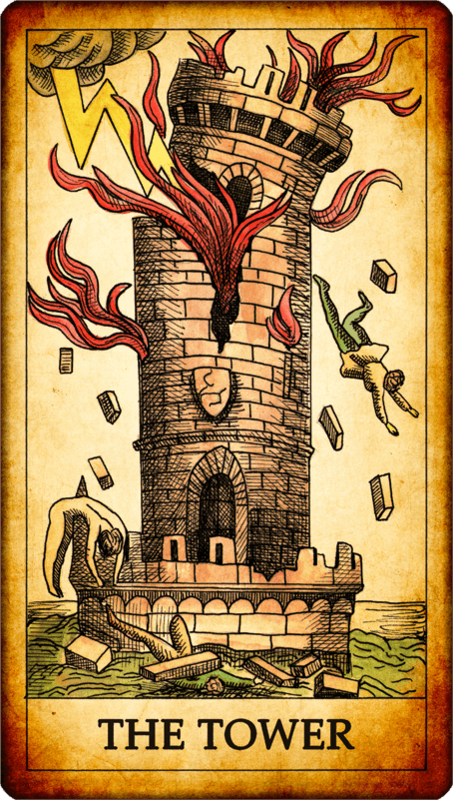 Apparently, because of it’s history and legend, Wittenberg has been chosen to be something of a hidden tribute to the conspiracy of divide and conquer, symbolized by The Tower card of the Economist Tarot. At the same time with the Faustian deal with the Devil for wealth, fame, power and pleasure through sorcery and trickery is evoked in The Magician card.. All of those themes play into the overall picture drawn here. 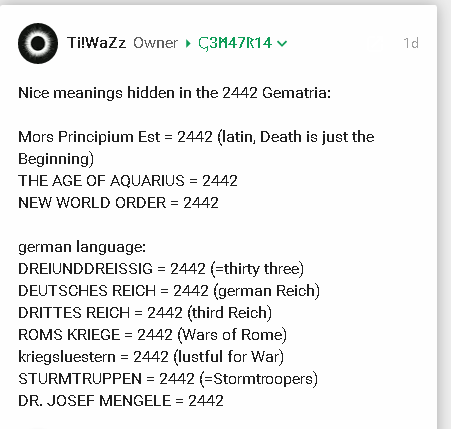 TiWaZz also He also found some correlations to Three-D in Jewish gematria. Three-D, trick, chaos magic, demonic god all equal 202 in Jewish gematria. Returning to the theme evoked by 54 in the Magician symbolism, it should noted that the words sun, love and engine all have gematria of 54. 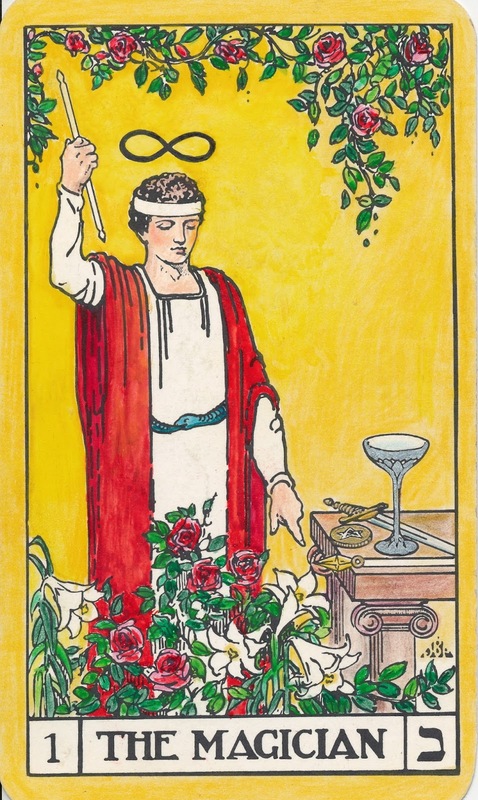 The Economist Tarot has a sun disk halo behind the VR Magician that is usually not there in other decks. 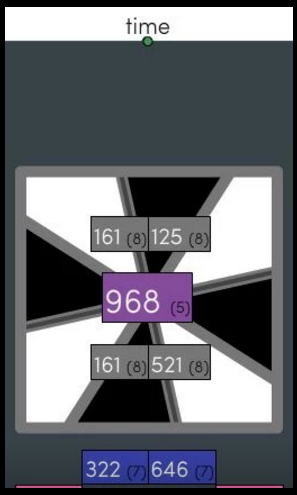 So in my opinion, the emphasis on 54 here calls attention to yet another undeniable link to gematria. 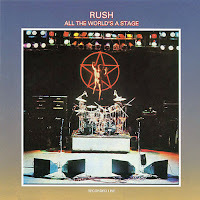 For starter’s the reduced gematria Saturn and Rush is 21. The first half of the album’s title is 21. 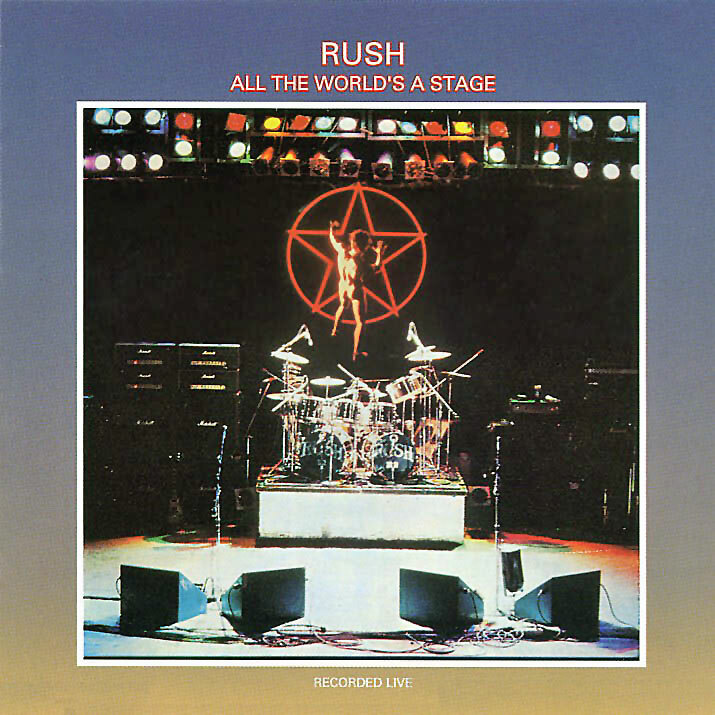 When you spell out the term Twenty-One Twelve is has reduced gematria that matches with the full gematria of Rush. 2112 is a palindromic number, which means that whens its reversed it’s still the same number. They are reflective and symmetrical, which is one reason why they’re special in numerology. When you break the number down into double digits and add them you get 33. 33 is a number of such intense focus in the occult, there are thousands examples of its use in symbolism. For instance, when viewed as a date, December 21, can be written as 21./12 or 12/21. Either way it’s a symbol of the Winter Solstice, the shortest day of the year when the Sun is at its ebb, marking the onset of Winter and a new year. Any time there’s cycles of time, death and rebirth, that’s the realm of Saturn, the keeper of time. When the date of the Winter Solstice is written out, December Twenty First, the reduced value is 90. There are only two numbers that equal 33 when written out, 16 and 90. The full sum of the term December Twenty First is 234, which is interesting for a couple of reasons. For instance, 234 + 432 = 666, which appears to be a significant pattern leading to the what many call the number of the Beast. Here’s a link to a search for 234 on FreeToFindTruth, which shows how often this number shows up in subliminal programming. 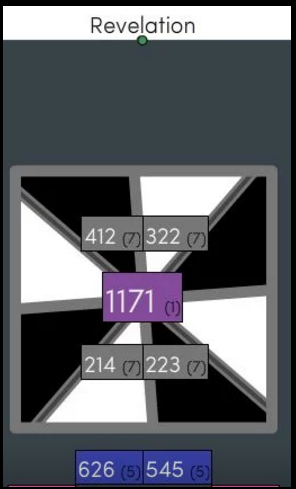 When your add the single digit pattern two three four, the sum takes us right back to 66, the gematria for Rush and Twenty One Twelve. 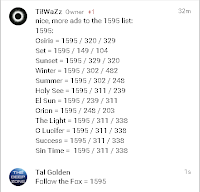 When you write out thirty-three it sums to 66 in reduced gematria and 156 in full gematria. At this point, I think we can safely say that there’s a pattern. Still, I want to close on this note. 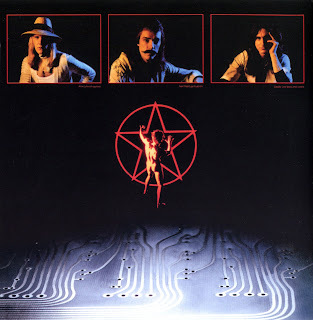 The album was originally released on April 1, 1976, a date with 28 numerology. 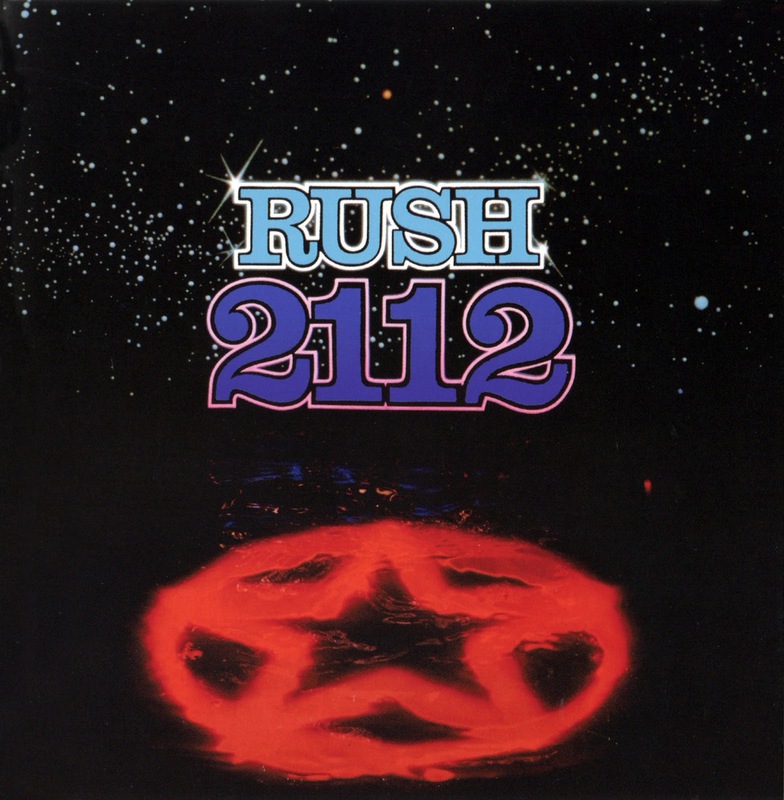 The 2112 40-year anniversary tribute album was released on December 16, 2016. a day with 28 numerology. The character on the Rush pentagram logo is known as “Star Man” There’s interesting things going on with the symbolism and gematria, here. There’s so much to cover with this topic, which I’ll get to in subsequent posts. Here’s some of what the Carpenter’s Key by +Mighty Messer reveals on this topic. 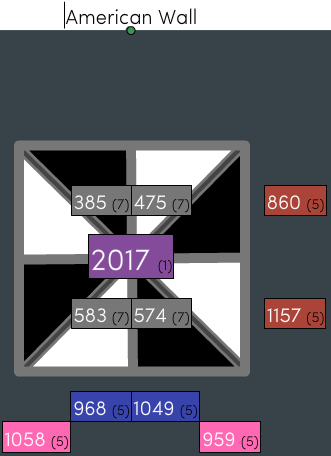 Remember the full sum for December Twenty First is 234. The full simple sum for the gematria of “Two Three Four” is 174. That coincides with the gematria for New World Order as well. The setting for 2112 is the dystopian world of Megadon City and the Temples of Syrinx, a new world order scenario. That’s more of what I’ll get into on the next article. 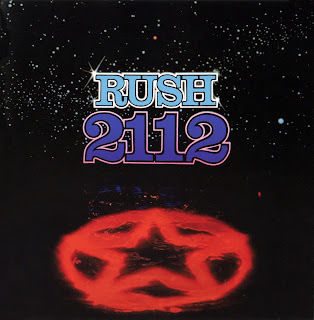 Remember the first release of 2112 was on April Fool’s Day, April 1, 1976. 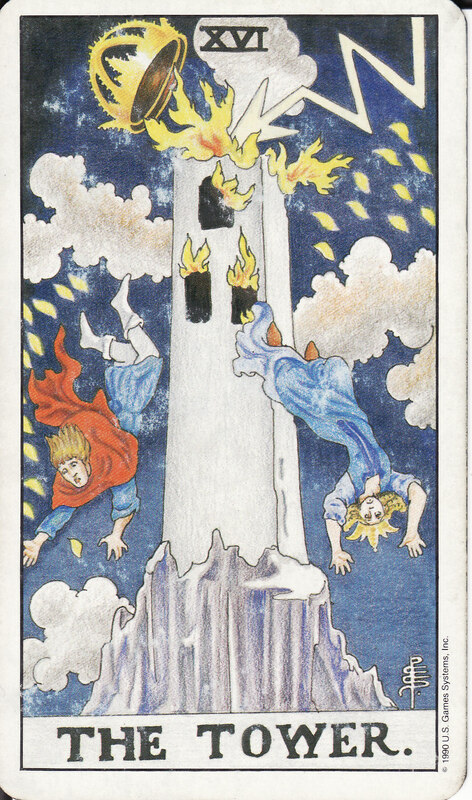 When a sudden, cataclysmic change occurs, such as what the Tower card suggests, it is an anomaly of sorts. Such a drastic upheaval means the Universe trying to wake us up from our zombie-like state. This wake-up call comes in the form of an event that blind-sides us and shakes us out of the fog we’ve been living in. The image on the top right is the closest match I could find for The Economist depiction of the Tower. it’s similar to the more developed Rider-Waite image that most people are familiar with. The bolt of lightning from the heavens strikes the top of the tower the queen crown falls away while she and the peasant tumbledown together. This symbolizes the change comes to all regardless of social class. In a personal interpretation the card, above all, represents sudden insight. However, in the context of the “Planet Trump” cover, there’s more to consider. For instance, on the Tower’s door there’s a representation of Martin Luther’s act of defiance against the Roman Catholic Church, the famous Ninety-Five Theses. In 1517, it was the custom to post announcements, complaints and proclamations on the doors of churches. When Martin Luther did this in Wittenberg on October 31, 1517, the official story is that he did not mean for his dispute with the Church to be debated in public. Rather, Luther claimed it was a scholarly issue between himself and other theologians. Nevertheless, the document sparked off an era of monumental change that is still part of today’s world. Behind The Tower are the faceless masses divided into two groups one with the hammer and sickle banner representing international communism, and the group gathered under the crucifix is probably meant to represent the Catholic church. At first glance, it seems to be another mind trick meant to confuse us. The hammer and sickle banner is of course the symbol of the old Soviet Union, which is no longer around. 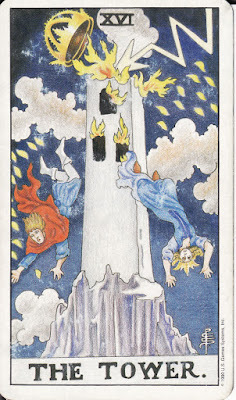 Furthermore, the Communists and the Catholic Church are normally seen as adversaries, but in the Economist Tower card it appears that the two separate camps are both marching on the Tower from different directions. 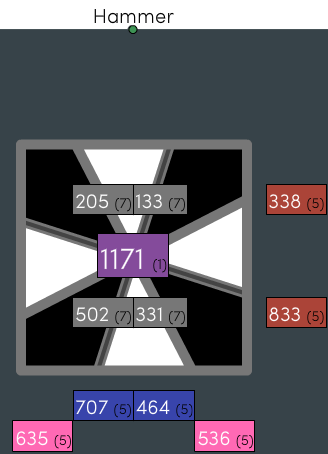 What could be the meaning of all of this? Historically speaking, both Communism and Catholicism have shown themselves to be authoritarian, hierarchical and repressive in the way they have used power and treated the individual. The Protestant Reformation had its own problems and ideological baggage, but all in all, it became a positive step in the right direction towards greater individual freedom and prosperity. The message that I see in the Economist Tower is that collectivist ideologies, whether they are politically or religiously based, are what Old Man Rothschild and the rest of the oligarchs want to impose on the world. To them, it doesn’t matter which form of mind collectivist mind-control you prefer whether it’s Christianity, Judaism, Islam, Communism, free market neoliberalism, or what have you. As long as one is under the spell of one or the other, it doesn’t make much of a difference. The more one models their thoughts and actions to that of a “true believer” or “company man,” the more one becomes a soulless cog of the System. Either way, it’s a lot easier to control large masses of people who don’t question orders than it is to get self-conscious awakened individuals to do your bidding, and give consent. In this series of we’re also tracing the symbology of Saturn. Since it so prevalent in The Economist’s Tower Card, it has be analyzed in conjunction with the other cards. The hammer and sickle are both symbols of Saturn. 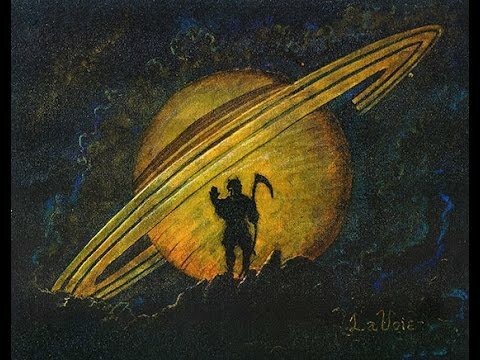 The sickle is a double reference to Saturn’s kingship over the entire earth during the Golden Age and also as Saturn’s rulership over time and the cycle of birth death and rebirth. The hammer is related to the masonic compass and square and symbols of the Master Builder, the Great Architect, or as the Greeks knew him, as the Demiurge. Both of these words have the 13/31 reflective numbers in their gematria. 13 is the sixth prime number. Saturn is the sixth planet of the solar system. 31 is the 11th prime number, and in astrology, Saturn rules the 11th sign of Aquarius, the Water Bearer. 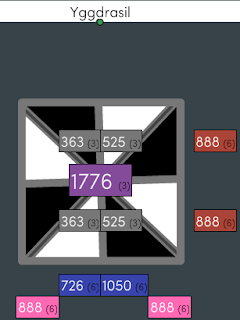 As strong as these associations are, they don’t stop there. In masonic symbolism, the half-goat-half man deity known as Pan is also a veiled reference to the planet Saturn. “Pan was a composite creature, the upper part–with the exception of his horns–being human, and the lower part in the form of a goat. 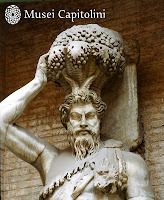 (…)The pipes of Pan signify the natural harmony of the spheres, and the god himself is a symbol of Saturn because this planet is enthroned in Capricorn, whose emblem is a goat” – Manly P. Hall, Secret Teachings of All Ages. Along the way, we’ve also added these other terms to this collage of correspondences. Judgment is one of the other cards in Economist tarot spread, as discussed in this article. 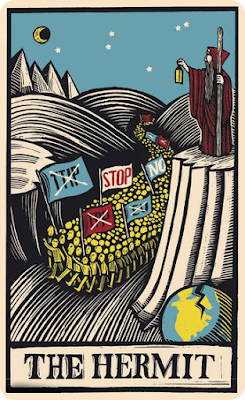 In this example, 31 ties into The Hermit card, also found in The Economist spread. The Hermit is also a Saturnine figure. His staff is a repetition of the symbolism of the invisible world axis. Appropriately enough, the Hermit is also featured on The Economist cover. It could even be Old Man Rothschild himself for all we know! 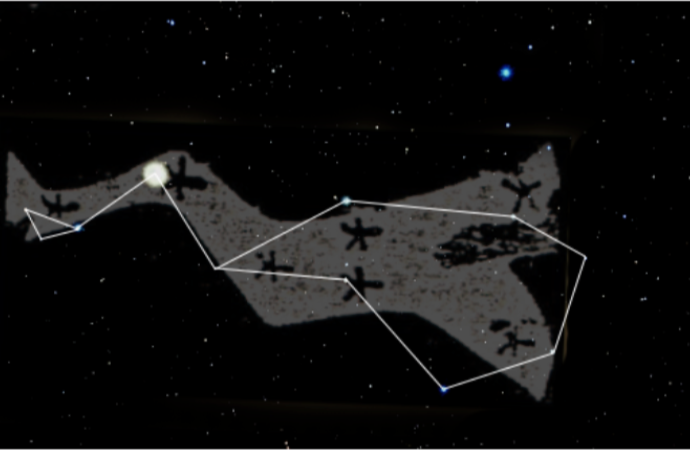 In Tarot, the star Arcturus is associated with The Hermit. In the last article, I compared The Hermit of The Economist Spread to Jacob Rothschild, head of the family and 50 percent owner of the publication. However, now I’m a lot more sure about the analogy considering this. As I wrote before, the summit that The Hermit stands on looks a lot like the natural formation known as Devil’s Tower in Wyoming. As we can see, the name Rothschild is a match with Devil’s Tower with 53 gematria. What makes this more intriguing is that it matches the gematria of the words oligarchy, the Greek word for “rule of the few,” and the word religion. For the oligarchs, it seems that it is their religion to dominate and desolate the Earth. Many think that it is Rothschild himself who is the leader of the globalist oligarchy. Whether or not he is, The Hermit of The Economist spread is the prophet of their creed of predatory capitalism and rule by elite families and banker tyrants. The Hermit has a staff or a pole in his hand. As stated before in this article, The Hermit’s staff is a reference to the Earth’s axis which extends into space from the poles. This, among other things, links him to Saturn and his cane. The staff of the Hermit also links back to idea of prophecy with its gematria of 52/16. 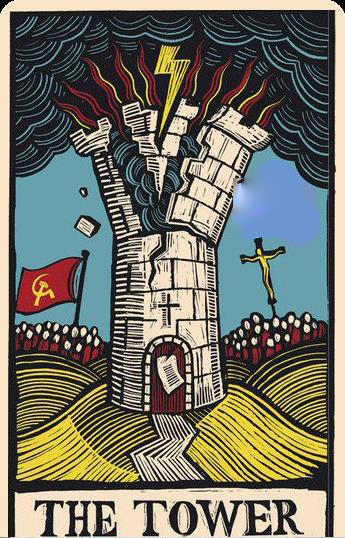 The image of Devil’s Tower links the The Hermit with The Tower of The Economist spread on a visual level and a symbolic one.If we keep in mind that Martin Luther posted his Ninety-Five Theses in the town of Wittenberg, there’s another link to gematria to consider. History shows that mass movements, wars, revolutions, economic fallouts and religious conflicts like the Protestant Reformation are often the result of conspiracies by secret societies operating from behind the scenes. I’m not making any predictions about what the sickos at The Economist are hinting at in their mind games but I just felt that the gematrical connections between The Tower and World War needed to be pointed out. It would appear that life on Planet Trump is going to be a rocky ride. 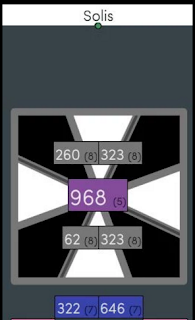 For a lot of our decoding, we’ve been using the Chloos app to calculate values for the Carpenter Keychain Code by +MightyMesser The story behind this amazing tool is remarkable and you can read about it in this article. To download the app follow the links and the directions below. Thanks to +theblissfullone for the video on Devil’s Tower that helped to uncover the tree symbolism. I like how he broke down the Roman numerals for 1776 and revealed the 666 coding. 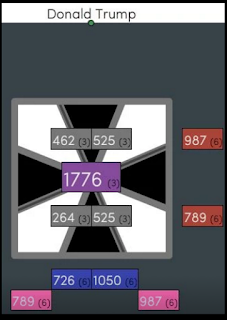 TiWaZz has also shown that the Carpenter Code, or something very like it must be a code known to the Bavarian Illuminati in the year 1776. What he’s found deserves a lot more attention and research, so I wanted to share this ASAP. 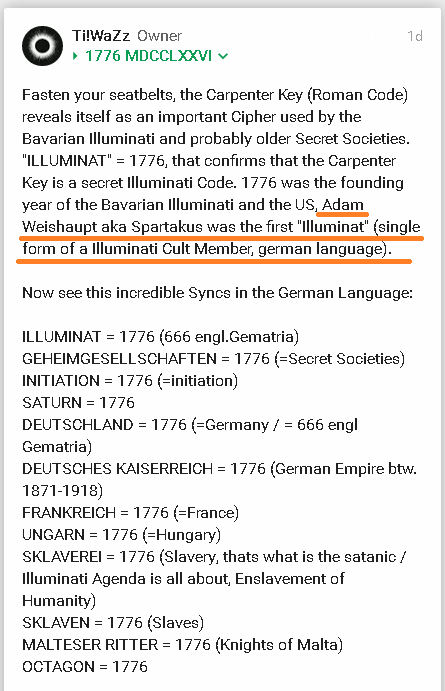 TiWaZz’s native language is German and the native language of the core group of the Bavarian Illuminati was German. The results speak for themselves. I’m beginning to see that Mighty Messer’s discovery is just what he says it is, a gift from above to help us to understand the spiritual dimension of what’s happening in this critical time in Earth’s history. Personally, I don’t see any contradiction in both those theories being true. 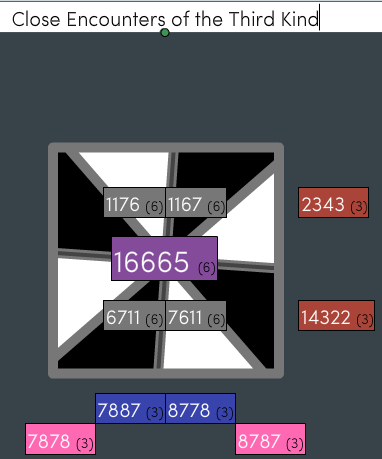 If the Bavarian Illuminati did actually use the code, and there is a lot of evidence to support that, I have no doubt that it was stolen from someone, somewhere down the line. Mighty Messer is a modern day prophet. That day he was on the pole and took a bolt of electricity, somehow he pierced the veil. I just realized that the article above is mainly about the Tower card of sudden, transforming energy. That was Mighty Messer’s “Tower” moment and it changed him and the study of gematria and numerology for the better, forever. His code reveals the frequencies that we as spiritual being are attracted to, which seem to to be good or bad for us, to and how the controllers have been hijacking them through weaponized language and symbolism. I hope more people get a chance to get to know his work and the other research going on, and using the great software that goes with it. Here’s some other syncs related to this study. 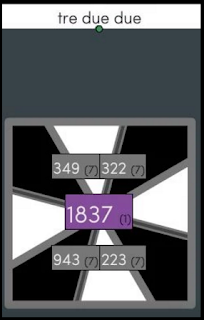 In this screen shot, you’ll see some amazing 1595 syncs that coincide with the subliminal message of “Follow the Fox.” Fox has the 6 + 6 + 6 pattern in its reduced gematria. 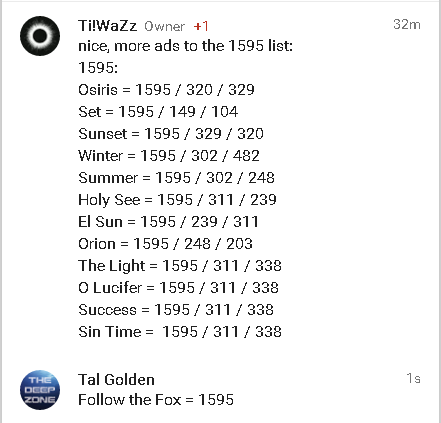 Fox has a full gematria of 45, a number corresponding to the Magic Square of Saturn. If you look at the numbers on the “Planet Trump” inset photos, you can see four 2’s and two 4’s. it could correspond with the Carpenter Key figure for sickle, which is 2222, a very interesting number. There’s a 1,3, and 6 as well. maybe with all of us working on it, we can figure out the rest. 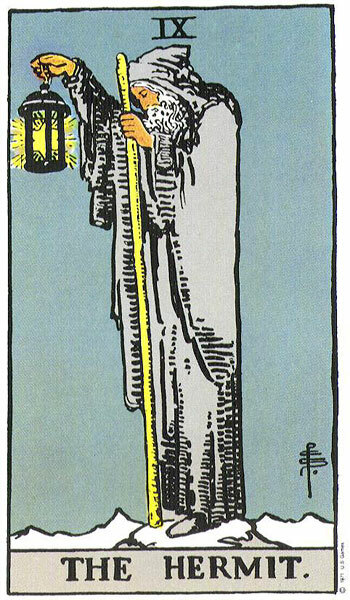 The Hermit is always portrayed with his Lantern. Wittenberg is where Martin Luther nailed his 95 theses to the door of the castle church. The recently “leaked” photos of the Economist 2017 cover are interesting for many reasons. The first question for me was, “Who leaked the cover?” After looking at the top stories on a web search on that question, I haven’t been able to find anything on the how. where or who’s involved in that move. The Economist website has nothing on it either. Oddly enough, no calls for an investigation have been released that might connect the “leak” to one or more the “fake news” outlets threatening the peace and stability of the neo-liberal, free-trade oligarchical world order. Those facts, I believe tell, us that it was intentional and supported from the highest levels within the organization. This doesn’t surprise me because it’s probably of the best methods to “get the word out” for a publication that claims to to be global, but only has a print circulation of about 1.5 million. They also charge top dollar for their brand of propaganda, aimed at the “highly educated” policy makers at the top and their minions. 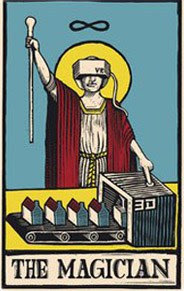 Nevertheless, the parodies of the tarot cards above show at least an awareness of the occult and the ability to convey a message through occult symbolism. In Britain and in most other parts of the world September 2 is written as 2/9 and even 2 + 9 = 11. With that for openers, let’s just assume leaks don’t happen at The Economist without Old Man Rothschild getting to the bottom of it in short order. He’s 50 percent owner of the The Economist, don’t you know. Besides, how else are they going to get anyone outside of the gilded cage to pay attention to a dry, boring, soulless free trade journal? The full numerology of the date looks like this. With the single digit reduced method and with the year broken into paired numbers, the numerology for September 2, 1843 comes out as 27/72. The reflection of the numbers is interesting, but what’s also even more important is how the date numerology matches up with the gematria of the word money. That’s what it’s all about at The Economist. Who’s making money, where to make money, and how to make more of it. They live and breath this stuff. 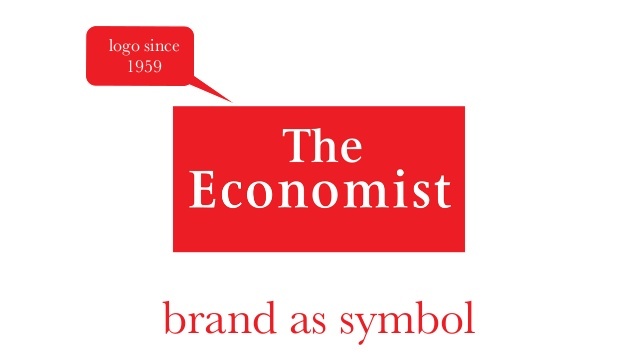 The Economist’s distinctive logo has a spare red background and an equally austere customized font. As you can see the word red has gematria of 27 in English ordinal, That matches the date numerology of the founding. Even the engraver who designed it in 1959, Reynolds Stone, has name gematria that links to the year of its design and release in ’59. And finally the title The Economist has gematria that stacks up very closely with that of United Kingdom. With all respect to the British, Welsh and Scottish people, Great Britain is, regrettably, the country of origin for a lot of these kinds of sick riddles and predictions of world events. Huxley’s Brave New World is a prime example of this sort of thing. There’s more to the logo I could go into, but the point of all that was to show that decoding the 2017 Economist cover is a necessary task. This is where, for better or worse, the Rothschilds and their oligarchical allies seem to get off on giving us hints what’s in the works for the rest of us. None of it’s written in stone, but these people like to get their way. The first thing to consider is the title of the cover, Planet Trump. This title is echoed in the second card which is a composite image of two Tarot cards, Judgement and The Emperor. The symbolism invoked with this cluster of images brings together other strands such as the trumpets of Judgement Day and the archangel Gabriel. When taken together, it creates an ambiguous situation. On one hand, it sets up Donald Trump as an Emperor figure who straddles the world to pronounce judgement. 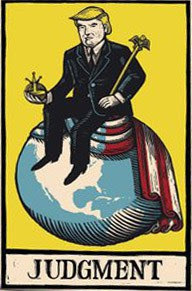 That’s the overt symbolism of the American flag covering most of the world in The Economist tarot card parody. 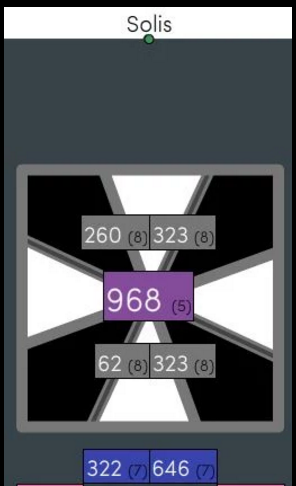 Once again, gematria helps us to see the hidden aspects kept backstage, away from public view. When gematria is applied to Tarot symbolism something powerful sometimes happens. It often exposes the power behind the throne, the globalist oligarchical conspiracy, also known as the new world order in the full light of day, for all to see. 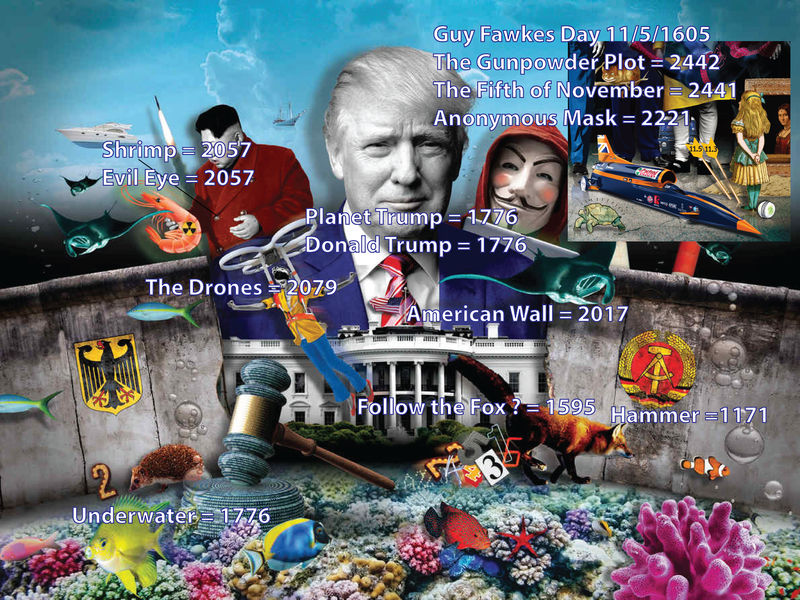 Here’s some more gematria that points to a fake showdown between Trump and the Oligarchy. There are two ways to spell judgement/judgment as can be seen on the two cards above. Without going into a long explanation, the spelling of judgment is used mainly in courts of law. That concept seems important to the oligarchy who always are careful to have legal power behind them. 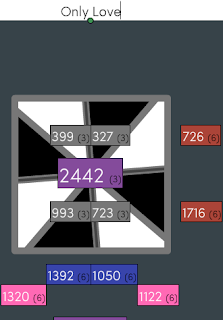 Still, there’s much more to it when you look at the gematria. In almost all of the decks I’ve seen online, judgement with an -e spelling most commonly used. So, the spelling of judgment calls attention to itself, in a subtle way. Ever since the days of Teddy Roosevelt, America and Britain have been said to have a special relationship. 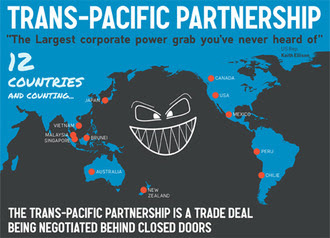 It’s the primary expression of the world’s power structure. When I see how judgment lines up with all these words, I’m inclined to think that what’s coming through is already apparent to the careful observer without the aid of gematria. Despite the appearance of Trump vs. the Globalists, behind the veil, it’s going to be business as usual and then some. The Rothschild’s first symbol was a red six-pointed star. Red Six-Pointed Star has 94 gematria just like the key terms just described. 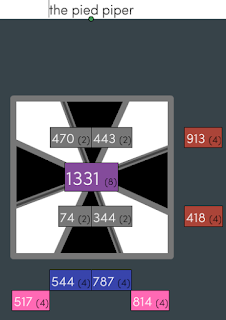 As explained in other articles, here and here, 31 is a number with multiple connections to Saturn. The words, cube, Pan, zodiac master, and debt several others all have 31 gematria. All these words have connections to Saturn, as explained in the articles linked. Debt is one word that directly pertains to The Economist cover, because it’s what the present economic system is built on. Not only that, the sickos at the top still think we owe them something. Money, attention, obedience and apparently everything that’s ours, our heritage, our integrity, our very lives we must offer up on their altar of Mammon. Red comes from the lowest frequency on the color spectrum. hexagram as the family symbol. This observation leads to the main interpretation to be drawn. The character Donald Trump is the one to be judged, and America is to be judged for the crime of electing him. At least, that’s what appears is the point of view of The Economist and the oligarchy it represents. One has to keep in mind that they’ve been playing a deceptive role in this drama as well as most of the media ever since Trump became a candidate for president in 2015. They’ve all been acting, Trump included. They’ve convinced many that he’s some kind of loose cannon, a populist and a man of the people. This gave him “street cred,” mostly with disaffected working-class whites who came out in record breaking numbers to vote. 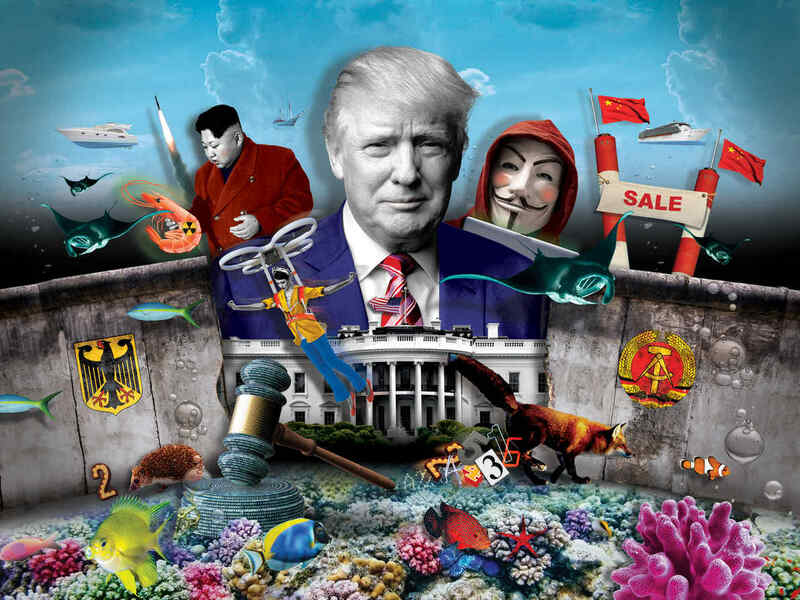 Personally, I have no doubt that Trump has been doing exactly what Old Man Rothschild and the rest of the oligarchs have had planned for, who knows how long. His appointments of globalist bankers, an oil tycoon, and other billionaires before his inauguration should make those people finally see the truth, even though it’s too late for that now. However, disillusionment is a bitter cup to drink from. For now, the stock market is soaring and the people who think they stand to gain from a Trump presidency are not in a mood to reflect on any possible setbacks. In any case, while researching for this article, I came across the fact that in the Talmudic commentaries, the archangel Gabriel is viewed as the angel of death over kings. This adds another layer of symbolism because Trump’s presidency is liable to be cut short by a fake assassination, which also seems to be an ongoing subplot, with numerous examples in popular culture, for predictive programming’s sake. In Tarot, Judgement means just what it says, a settling, the balancing of affairs. The hammer of fate falls when Gabriel’s horn is sounded. It’s as simple as that. That concept is related to another trump of the major Arcana, Death. When dealing with karma, death, cycles of nature and time, those archetypal problems are presided over by the planet Saturn. In some tarot decks, the Grim Reaper is shown with Saturn’s scythe, as in The Economist deck, shown on the left. 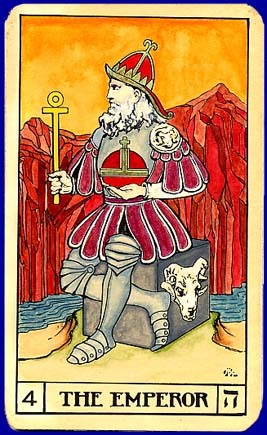 In the Rider-Waite deck shown on the right, he’s outfitted as the Dark Knight holding a black banner, another reference to Saturn. Black is well-known as the color that symbolizes that planet. 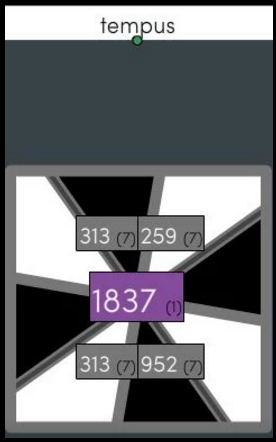 It’s also the 13th tarot card, a number that ties into the gematria of cube and Pan,. both important embodiments of Saturn. The mushroom cloud of nuclear war, the stricken landscape and the mutant mosquitoes show just how twisted these people’s minds are. Are they telling us that nuclear Armageddon is on its way? The radiant sun in the background, repeated from the World card does offer the smallest glimmer of hope, but for who? It’s crtainly a far cry from how mythology deals with the end of the world. 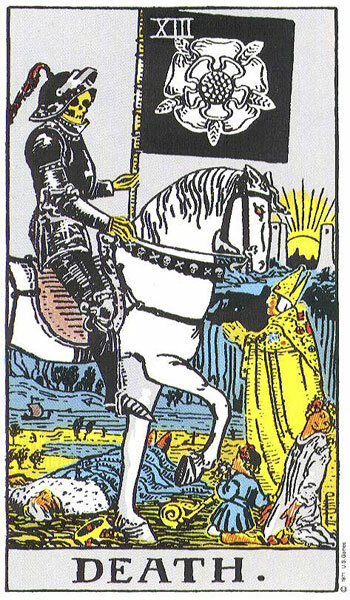 The Death card of the Rider-Waite deck doesn’t look like it came from a den of psychopaths like the images on The Economist deck. Even though Death is mounted and on the road, the landscape still breathes with life. The only way Trump would ever go go nuclear is if Old Man Rothschild told him to attack Iran or something like that. That would make his buddy Putin really mad. So on the other hand, when I see that the gematria of Armageddon and free trade coincide, the message may not be quite what it seems on the surface. For the most part, people who have only known life in the West don’t understand the world shattering effects of free trade capitalism on traditional cultures and their ways of life. Yet, that will have to wait for another article. 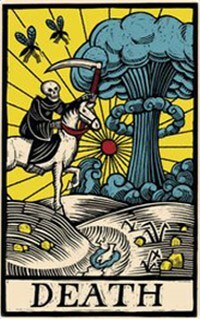 After looking at the Death “card” for awhile I realized that the mushroom cloud looks quite a bit like a tree. 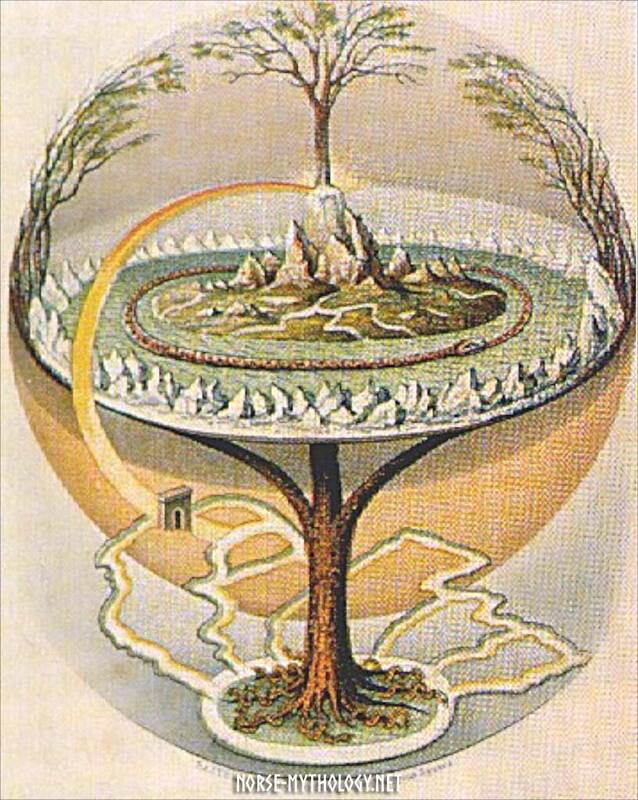 Once I saw the tree/Saturn connection, I realized that the hidden symbol is the “world tree” of mythology that holds up the heavens. In Hamlet’s Mill, a book discussed in this article, the authors show how the world tree symbolizes the celestial pole or axis of the earth that extends into the heavens. This tree is associated with Saturn because to the ancients, it appeared the most distant from the sun and closest to the fixed stars. The Saturn figure appears as the Old Man who knows his craft. He may be a smith, a miller or a builder. If you read the article here, you’ll see what I’m talking about. matches with the word prophecy. We’ve already discussed the importance of 31 to Saturn, the 121 number for the full gematria coincides with the word Revelation. Moon conjunct Arcturus: New friends, business success, good judgment, domestic harmony. If with Mars also, danger of death by suffocation. That part sounds pretty good except for the part about suffocation by Mars. The troubling things in the picture are the split in the globe over North America and the summit of what looks like Devil’s Tower where the Hermit is standing. The people are marching but where they heading? How much long will they follow the swan song of the Pied Piper of Manhattan before the Old Man on the Silver Mountain lets the hammer fall? Here’s something else I found on Arcturus. According to Ptolemy the influence of the constellation is like that of Mercury and Saturn, though the star Arcturus is like Mars and Jupiter. It is said to give prosperity from work, strong desires, a tendency to excess, a fondness for rural pursuits, together with some liking for occultism. Donald Trump is a descendant of Olaf the Black the last of the Pirate Kings. He ruled over the Isle of Man during his reign in the 12th century. More to come next week on the other cards of the Economist Deck! Thanks everyone for the input and ideas. It’s beena good week for gematria decoding! I was troubled earlier today, but now I feel much better about things. Only the power of love can disarm the oppressors. The rancor and division must be quelled, and only love can give us the courage to reach out in friendship. Once we follow the mandate of kindness in all its authority, we will begin to understand what our true destiny is. ― Maxims of Ptahhotep, 3400 B.C.